Every time someone new visits our yard, we take them straight to our kaffir lime tree (Citrus hystrix) to introduce them. We find that most people have never heard of it. However, those that are familiar with it absolutely love this fabulous tree. This is one of our kaffir lime trees. It needs pruning. The butterflies love this tree. The first thing I do is pick a leaf off the tree, crush it and stick it right up to our guests nose and say, “smell this”. The reaction is always the same… oh wow! We never fail to send our guests home with a freezer bag full of the fresh leaves. They freeze perfectly for later use. They can frequently be found in the freezer section of most Asian markets in the U.S. The kaffir lime leaf has a unique shape and flavor. Citrusy and aromatic. It’s tough to describe the flavor and smell of the kaffir because it is unique. It’s very pleasing though. Most people love it right off the bat. Personally, I don’t think I could live without it in my life. Okay, that might be a tad dramatic, but you get my drift. It’s exquisite. I have a kaffir lime tree growing in my front yard and in the back. My kids love to grab a leaf as they walk by the tree, crunch it up in their hand and hold it for awhile. Sometimes they’ll bring some leaves in the house to throw in their glass of water or lemonade. I do cook with the leaves quite a bit too, especially in my coconut milk, lemongrass chicken and Thai curries. The leaves are used to flavor and are not usually eaten. For some more kaffir lime leaf recipe ideas, check out ThaiTable.com. 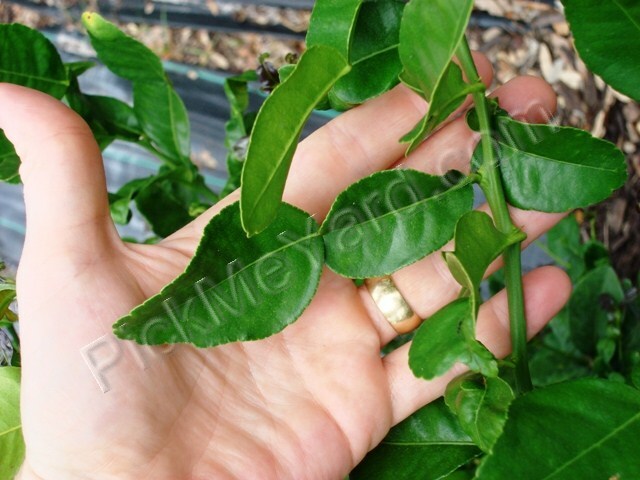 It is the leaf of this citrus tree that is generally used for culinary reasons, not the fruit. We’ve started using the fruit recently though and now we wonder why we didn’t start using it sooner. The fruit tastes exactly like the leaf but it’s very sour (a little bitter maybe). We think the kaffir lime makes a wonderful drink and we even add the zest to the drink. I like to add a little of the zest to my yerba mate too. I’m sure there are thousands of ways to use this incredible flavor. I will not be letting them fall off the tree to rot anymore. Funny looking, bumpy, and very sour kaffir lime. 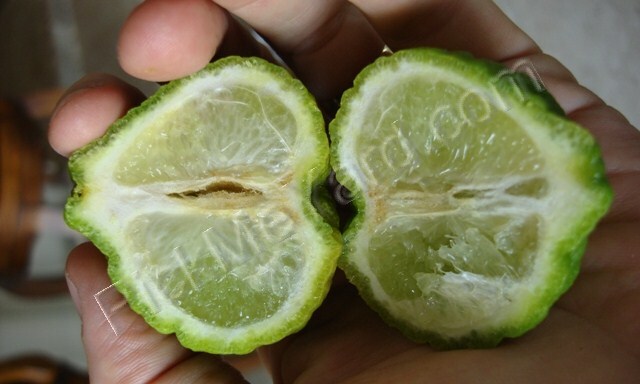 A kaffir lime cut in half. 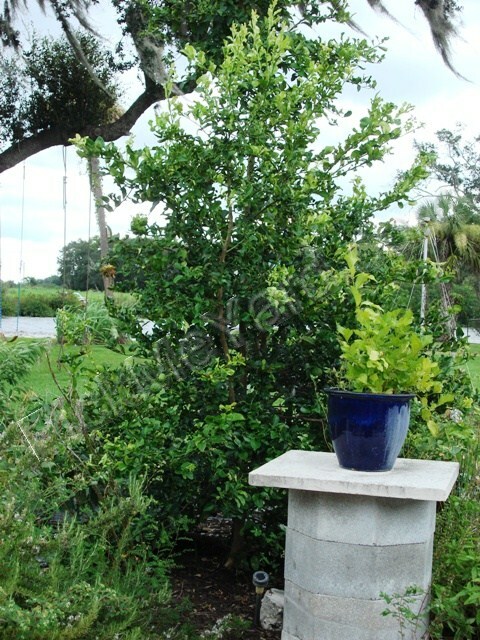 The kaffir lime tree grows well in zones 9, 10 and 11. It is susceptible to frost damage. My trees have been through a couple very cold Florida winters recently and only had minimal damage. They recovered quickly from their frost bite. 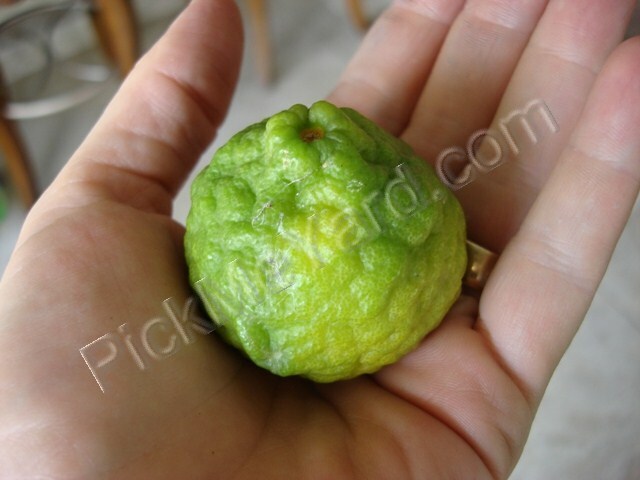 Check out LifesDandies.com for more information on finding a kaffir lime tree in Florida. I haven’t grown a kaffir lime tree in a container for myself, but I’m certain the tree would do well if it was taken care of properly. It would need to be fed during its growth cycle and shouldn’t be overwatered. My favorite book on growing edible trees in containers is Growing Tasty Tropical Plants*in any home, anywhere… by Laurelynn G. Martin and Byron E. Martin. I love this book for its pictures because it inspires me and gives me great ideas. The book gives some information on how to grow tropicals inside, but I think it could use a lot more. It still remains one of my favorites. 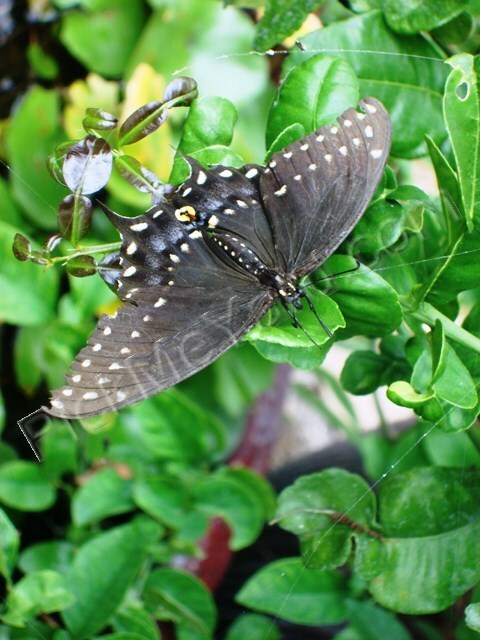 A female Eastern Black Swallowtail on our kaffir lime tree. Have I talked you into growing a kaffir lime tree for yourself? I hope so. Moringa is the miracle. It’s called “the miracle tree”. The scientific name is Moringa oleifera. In agriculture, it is used to feed livestock and provide fertilizer. It’s also used as a hedge. The seeds can be used to purify water. An oil extracted from Moringa can be used for cooking that is as nutritious as olive oil. The roots and flowers can be eaten as well. Do you see why it’s called the miracle tree? No other word better describes this tree. Truly a miracle of nature. Amazing. 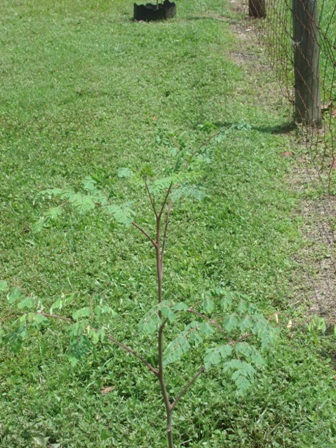 This is a small moringa tree growing in our yard. 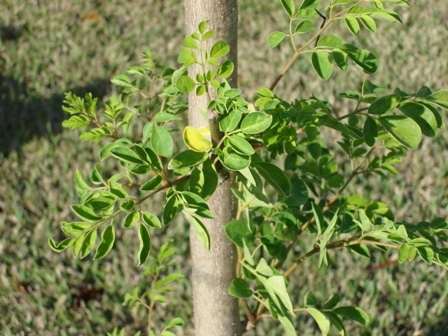 Moringa is mainly grown for its leaves. 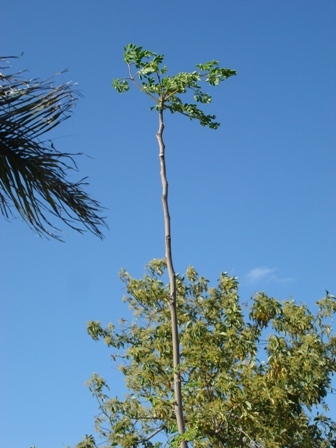 The more a moringa tree is trimmed and cut back, the more leaves it produces. It will grow into a large tree, but it is best kept trimmed as a small hedge so the leaves can be easily harvested. The leaves contain 7 times the vitamin C of oranges, 4 times the calcium of milk, 3 times the potassium of bananas, 2 times the protein of yogurt, 4 times the vitamin A of carrots and 3/4 the iron of spinach. When the moringa leaves are dried and powdered, they contain 1/2 the vitamin C of oranges, 17 times the calcium of milk, 15 times the potassium of bananas, 9 times the protein of yogurt and 25 times the vitamin A of carrots. It has almost the same amount of protein as an egg. I read this information on a website called Trees for life where there is a ton of information about moringa. This picture is the same tree in our yard as the picture above it. This is after 8 months of growth and several hard freezes in our zone 9b. It looks taller in the picture than it really is. I need to cut it back down to size which is easy to do. It has sprouts up and down the tree. The four other moringa trees that we planted froze to the ground. However, it looks like the stumps are trying to sprout and might survive after all. The tree produces seed pods that contain about 10-20 seeds. 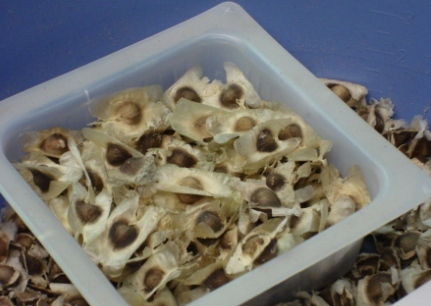 They can be dried and stored or cooked fresh, like peas. The leaves are mostly used when they are dried and powdered, but they can be eaten fresh. I wouldn’t describe them as delicious or more-ish (you know, when you want more and more of whatever you are eating), but I would eat them if it became necessary. I feel the same way about our chickens, ducks and pigeons. In southern Ethiopia, many families have a Moringa stenopetala tree in their garden. They cook the leaves the same way they cook a vegetable. It is considered a status symbol there to have one of these trees. The Moringa oleifera has smaller leaves than the latter, but they are both highly nutritious. 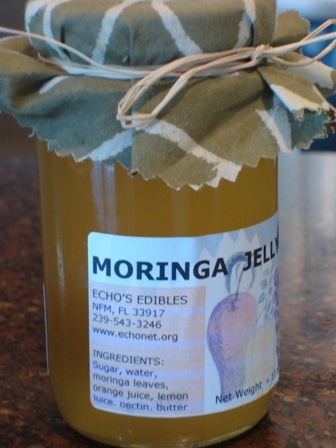 This is definitely my favorite way to eat moringa…as a jelly. The taste is delicious. I usually make a tea with the powdered moringa leaves that I purchased from Echo’s bookstore. They also sell the nutritious powder in a convenient spice container so it can easily be sprinkled on your food for an extra vitamin and amino acid boost. It is supposed to help memory and concentration too. 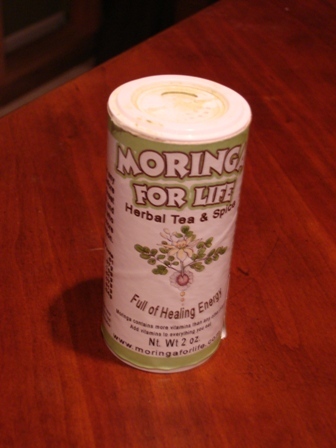 The dried powder can be ordered at moringaforlife.com, as well as many other moringa products. The literature says it is really good for children, but my kids crinkle their noses and run. The powder has an earthy, green flavor. It’s hard to describe. When the tree is about 8 months old, it begins to flower and flowers year-round. The bees love it. The flowers are edible and can be fried or used for tea. In Haitian folk medicine, the flowers are used to treat the common cold. They boil the flowers and steep them for five minutes and drink with sugar. Many other countries, including India, have tons of folk remedies for the moringa, especially the bark of the tree. However, the bark is toxic and should be avoided. To top it all off, the trees are beautiful. We love that we are able to grow them in our yard. For more background reading on moringa, try “The Moringa News Network“. They constantly revise and add to their site. Another interesting site is anamed, a charitable organization dedicated to saving lives in the poorest of nations.